Art theorist, curator, artist, poet. Born 1946 in Brno. Completed his Czech and German studies and aesthetics at the Faculty of Philosophy at Masaryk University Brno (1965-1970), with a graduation thesis on the development and typology of visual and phonic poetry. 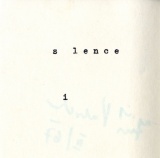 Since 1963 he has created visual poetry, and exhibited since 1966 By the end of the 1960s his work transformed itself in accordance with the march of concrete poetry and conceptual art. In 1968 he organised Computer Graphic art exhibition in Brno, which travelled to Jihlava and Gottwaldov. 1972-2001 he has been a theorist and curator in The House of Arts in Brno (Dom umění města Brna) where he realised exhibitions of the key personalities of Czech art (V. Boštík, Milan Knížák, Vladimír Boudník, J. Kolář, B. Kolářová, A. Šimotová, L. Novák), after 1990 also the authors from abroad (R. P. Lahnse, G. Graser, R. Mieldsam, R. Barry). After the realization of the exhibition Contemporary Czech Drawing he was restricted from publishing. Since the early 1970s he has cooperated on the organization of non-official exhibitions at several different places in Czechoslovakia. 1968-1972 he was a member of the Klub konkretistů (Concretists' Club) and since 1997 he has been a member of the Brno section of the Klub konkretistů 2; since 1991 he has been a member of the TT Klub of Creative Artists and Theoreticians. Lives in Brno. Klára Kubíčková, "Čtyři tváře Jiřího Valocha"
This page was last modified on 10 December 2015, at 00:42. This page has been accessed 14,727 times.